The lack of heavy armour was made up for by the tank's high speed provided by a Rolls-Royce Meteor engine. The Centaur was externally almost identical to the Cromwell, the major difference being the installation of the less powerful Liberty engine. 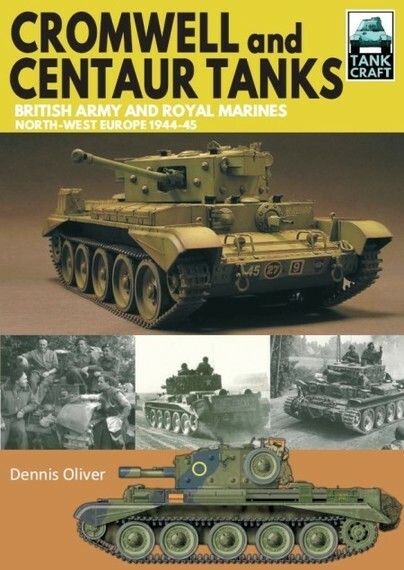 While the Centaur equipped the Royal Marines during the Normandy battles, the Cromwell served until the end of the war and formed the basis for the Comet. In his fifth book in the TankCraft series, author and illustrator Dennis Oliver uses official wartime photographs and comprehensively researched, exquisitely presented colour profiles to tell the story of the penultimate British cruiser tank. In common with all the titles from the TankCraft series, the large full-colour section features available model kits and accessories as well as aftermarket products. In addition to the colour profiles there is a gallery of expertly constructed and painted models. A separate section explains technical details and modifications made during production and in the field, giving the modeller all the information required to recreate an authentic replica of one of the tanks that served from the Normandy beaches to the final battles in Germany. Tuote on lisätty luetteloomme tiistaina, 28. elokuuta, 2018.